Brumbies captain Shellie Milward (centre) has been named in the Wallaroos squad. Photo: Supplied. 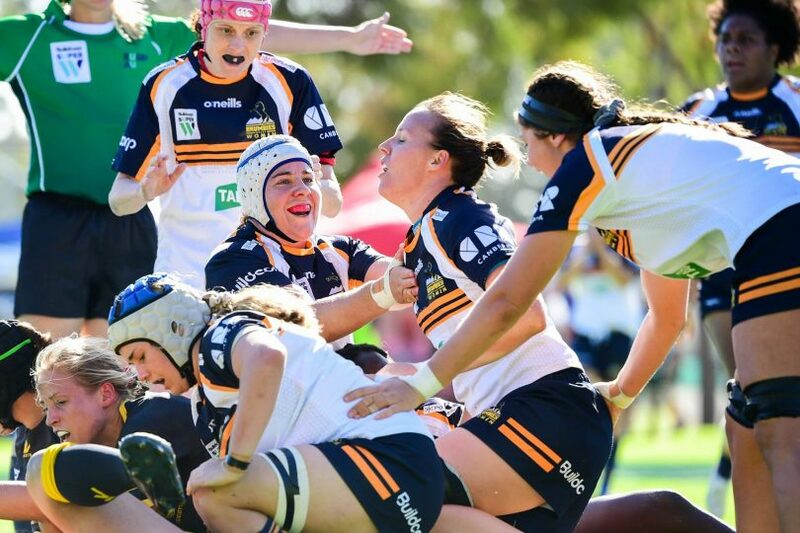 Six Brumbies stars have been named in the Wallaroos extended 47-player squad as the international side begins its preparations for the 2021 Women’s World Cup and a four-test 2019. Michaela Leonard, captain Shellie Milward, Georgia O’Neill, Tayla Stanford and Violeta Tupuola will return to the Wallaroos squad while Sammie Wood will make her debut appearance with the international squad. Wallaroos coach Dwayne Nestor named a host of injured players and 15 uncapped players on Thursday morning (11 April), including Brumbies no. 8 Tayla Stanford, who went down with a knee injury in the Brumbies Super W semi-final loss to the Queensland Red nearly two weeks ago. Stanford’s stellar Super W campaign did not go unnoticed by selectors, with Nestor earmarking the forward as a key player in his World Cup plans. “This is a strong extended squad after what has been a really pleasing Super W season,” he said. “We saw the standard of the competition continue to grow and that has led to an improved squad of players to select from. The players will train in state-based groups for the next three months before convening in Newcastle ahead of their 6 July test against Japan. Forwards: Millie Boyle, Emily Chancellor, Rebecca Clough, Toa Filimoehala, Grace Hamilton, Alisha Hewett, Evelyn Horomia, Fi Jones, Asoiva Karpani, Michaela Leonard, Kiri Lingman, Ashley Marsters, Shannon Mato, Michelle Milward, Averyl Mitchell, Sera Naiqama, Georgia O’Neill, Liz Patu, Emily Robinson, Christina Sekona, Ana-Lise Sio, Tayla Stanford, Violeta Tupuola, Darryl Wickliffe. Backs: Katrina Barker, Iliseva Batibasaga, Mhicca Carter, Cottesloe, Georgia Cormick, Lori Cramer, Alana Elisaia, Courtney Hodder, Zakiya Kereopa, Atasi Lafai, Chloe Leaupepe, Alysia Lefau-Fakaosilea, Crystal Maguire, Nareta Marsters, Cobie-Jane Morgan, Mahalia Murphy, Asako Ono, Shanice Parker, Trilleen Pomare Kalamunda, Sarah Riordan, Maya Stewart, Samantha Treherne, Samantha Wood.